One of the best parts about summer is making memories by taking the family out for some cool, refreshing water fun. In Hendricks County, Indiana, we boast plenty of options including two waterparks, three splash pads and even a place to get wet while shopping at our local mall. What follows is a short breakdown of each and a few tips. 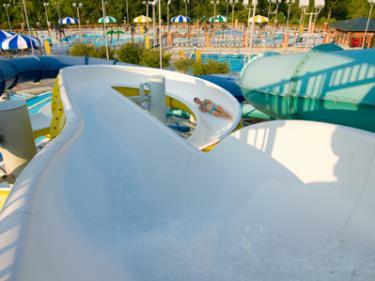 The most popular and well known spot for water recreation in Hendricks County can be found at Splash Island Family Waterpark in Plainfield. This 4.3-acre, tropical-themed water play land has something for everyone. Amenities include a 900-foot leisure river, three waterslides, a water playground with zero-depth entry for toddlers, diving boards, lap swimming pool and more. I&apos;ve previously put together my Top 10 Insider Tips for a visit to Splash Island including little nuggets that even some regulars may not know. It is a must-read if you are planning a visit. Splash Island opens for the season every Memorial Day Weekend and remains open until Labor Day Weekend and has various pricing options. For more information, click here. If you are seeking water fun but fewer crowds and are willing to sacrifice a few less amenities, Gill Family Aquatic Center in Danville may be a better alternative for you. Located on the back side of Ellis Park, Gill provides nearly as much fun despite its smaller size at a more affordable price. 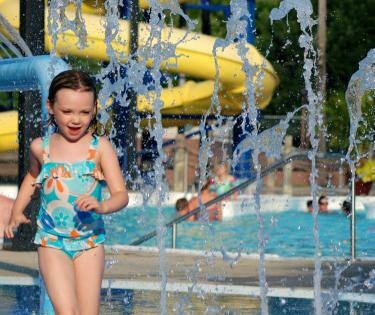 The park has two water slides, a splash pad and a zero-depth entry pool with a small slide for young children. It also has a diving board and a pool with lap lanes for swimming. As is the case with Splash Island, Gill Family Aquatic Center also has concessions, so you don&apos;t have to leave the facility to eat. For more information on pricing and hours, click here. If you would prefer a free option, then the county&apos;s three splash pads provide great alternatives. 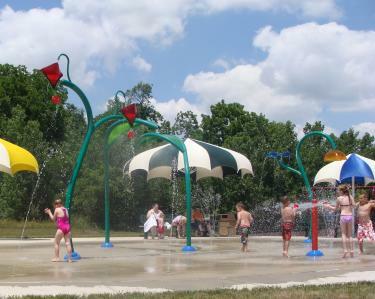 Located in the back of Williams Park in Brownsburg, the Watermill Splash Pad, features amenities for all ages. Along the outside are small features for any water-loving tot. As you head to the inside of the circle, the amenities get bigger and wetter. The most unique water contraption, the Superwave, brings in the bravest of kids to get doused in a 32-gallon downpour. This park has great space surrounding it to lay out a blanket and watch the kids have a blast and plenty of other amenities for the kids when they get tired of the splash pad including the very popular Blast Off Playground. 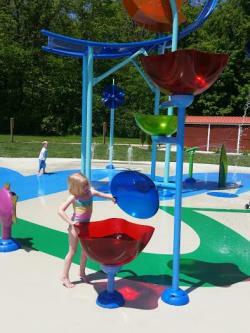 For more information about the park or splash pad, click here. 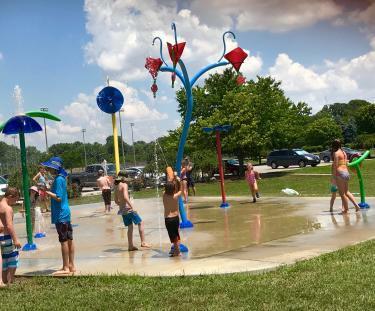 The splash pad in the bottom portion of Washington Township Park, 312 Whipple Lane in Avon, opens Memorial Day Weekend through Labor Day Weekend, weather permitting. The best tip I can give you is to try to show up early if you want a spot on any of the benches around the splash pad or bring your own chairs. There are shaded picnic tables on each side of an adjacent shelter, but those areas can be rented out for parties. There are a few large umbrellas with benches underneath but those spaces are limited, so you may want to slather on the sunscreen even if you aren&apos;t planning on getting wet. As an added bonus, if your kiddos get tired of the water, an adjacent playground provides an entirely different fun experience. For more information about the splash pad, click here. The final splash pad option is situated in the center of Guilford Township&apos;s beautiful Hummel Park just off Center Street in Plainfield. This is another free option that is open from 11 a.m.-7 p.m. weather permitting and remains open for the season until weather dictates its closing. I&apos;m told this splash pad fills up quickly though and only has space for about 45 guests comfortably, but there is a playground and other amenities in the park to enjoy as well. While this is probably not a space where you can spend a day or even an hour or two to cool off like the other options on this list, it does have its own side benefits. It is inside an outdoor lifestyle mall, so there are plenty of other activities including shopping, restaurants and a movie theater. Think of this option as more of a pit stop for the kids. For more information about The Shops at Perry Crossing, click here.